This Christmas Young & Lost Club will be releasing a very special mini album with Noah and The Whale. Noah and the Whale present The A Sides: Four men, one studio, two late nights and a two take limit. 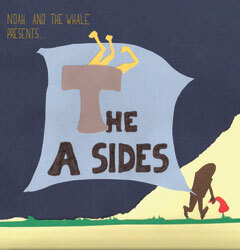 The A Sides are the product of left-over studio time from recording Noah and the Whale B sides. Freed from a subterranean high-security safe of mainstream musical conformity by London’s finest purveyors of cutting-edge crushed velvet musical mayhem, Young and Lost Club are releasing a limited pressing of 2500 12” EPs just in time for Christmas! Inspired by the success of their visit to grandfather Cyril’s retirement home and the seasonal spirit, the band have decided that all profits from the release and from a second live show on the release date will go to the charity Age Concern.